27 3/8 by 39 7/16 in. 69.5 by 100.2 cm. 36 1/8 by 28 9/16 in. 91.8 by 72.5 cm. 47 1/4 by 55 1/8 in. 120 by 140 cm. 37 13/16 by 39 3/4 in. 96 by 101 cm. Mitchell-Innes & Nash is pleased to announce the opening of their exhibition "Edvard Munch: Paintings, 1892 - 1917" which is scheduled to run from February 7 - March 10, 2001. This will be the first exhibition of Munch's paintings in New York in over 20 years. Gathering together a select group of paintings, the exhibition will focus on the artist's early period from 1892 to 1917, a quarter-century that saw the peak of Munch's creativity. Born in 1863, Edvard Munch's early years were marred by the tragic deaths of his mother and sister- events that profoundly influenced his art. 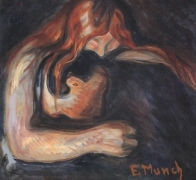 Active in bohemian circles in Kristiania (now Oslo), Munch first came to prominence after accepting an invitation to exhibit in Berlin in 1892. The public, scandalized by his paintings, forced the premature close of his show, which nonetheless continued to travel throughout Europe. He would later become an exhibiting member of the Berlin Secession and was represented in the ground-breaking Armory Show of 1913. By the 1920s, Munch's artistic achievements were already being celebrated in retrospectives held at the Nationalgalerie, Berlin and the Nasjonalgalleriet, Oslo. With many works seen in the States for the first time, the exhibition includes iconic images which form the cornerstones of Munch's oeuvre: the female vampire; cold, barren beaches; symbols of fertility; women on the brink of maturity. His deeply personal expressions of psychological and cosmic dread and longing retain their power to startle and disconcert. A fully illustrated catalogue with an essay by Janine Perron of the Museum of Contemporary Art, Chicago will accompany the exhibition and will be available through the Gallery. An opening night reception will take place at Mitchell-Innes & Nash on Wednesday, February 7 from 6 to 8 pm. This exhibition is presented in collaboration with Galleri Faurschou, Copenhagen and de Pury & Luxembourg Art, Zurich to where the exhibition will travel. For further information or transparencies please contact Robert Grosman of Mitchell-Innes & Nash at robert@miandn.com.